Established for more than a century, Sharkey Funeral Directors are a family owned and independent firm. Having had businesses also in coffin & casket manufacture, timber milling & coach building as well as funeral directing, the firm have developed world class knowledge of the funeral business. Now in the fourth generation, Sharkey Funeral Directors provide professional service and advice in all aspects of funeral arrangements and funeral services. Written by Tom Sharkey III of Sharkey Funeral Directors, the following article appeared in an industry journal in 2003. Sharkey Funeral Directors, 100 years of caring tradition. Tom Sharkey & Sons have been funeral directors for more than four generations. At the beginning of the last century Tom Sharkey I, was the proprietor of an extensive business in Ballaghaderreen that included sawmills, forge, coach building, joinery and coffin and casket manufacturing works. In those early years funerals were relatively simple for the funeral director (or undertaker) in that the usual order simply consisted of coffin, habit/shroud and hearse. It was therefore a natural progression from making coffins to follow onto a complete undertaking service. 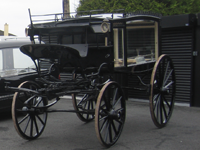 So he purchased a horse drawn hearse and established himself as an undertaker. Before long he needed additional hearses and ended up with four, which consisted of two “Town Hearses” and two “Country Hearses” and the appropriate accompany of carriages for mourners. The Town Hearses were not, as the name would suggest used for town funerals only, rather they were used for all funerals. For long journeys the Country Hearses were used because they had a much lighter structure and were less tiring on the horses. Irish-American poet William Brendan McPhillips was born in the Bronx on April 4th, 1937. His poetry anthology "The Place" contains over one hundred poems, a significant portion of which deal with discovering his ancestry in Ballaghaderreen, Co. Roscommon in the west of Ireland. One of these poems surrounds his memories of Sharkey Funeral Directors, captured in his poem "In Sharkey's Yard". From time to time we receive kind messages of support and thank you's for our work. We have presented a few of them here as a testament to the quality of our service. Names and such have been withheld as appropriate. Just to say thank you for all the help, the patience and for being so caring at a time that was so hard and upsetting. You were totally fantastic and understanding to me and my family, and I wish you and your family from the bottom of my heart all the best in the future. The world’s a better place with you in it. Thank you all, E. and family. Irish TV programme "Roscommon County Matters" paid us a visit to take a look at the long tradition of caring for people at their time of death at Sharkey Funeral Home in Ballaghaderreen. To skip directly to our part go to the 12 minute mark.